Hen is a female bird(chicken), especially of a domestic fowl. People often keep hens in order to eat them or sell their eggs. Here are 11 powerful lessons we want to learn from the hens. ✔1. Hen is a good planner, She first look for where to lay her egg and lays enough eggs before sitting on them. ✔2. Hen is highly discipline when she starts sitting on her eggs, she minimizes movements in and out where she lays her eggs. ✔3. She physically loses weight while sitting on her eggs due to decreased in feeding, she will stay on the eggs for many days before she will go out and look for what to eat. ✔4. 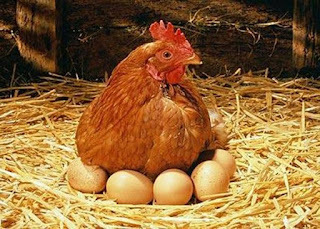 Hen does not discriminate between her eggs and others, She can sit on eggs for another hen even when you mixed eagle egg with her eggs, she will generously covered all together until those who are good hatched. FAITH, HOPE AND NOT DISCOURAGED. ✔6. Hen easily detects unfertilized eggs and rolls them out, then focus on the remaining eggs to mature and fertilize. ✔7. 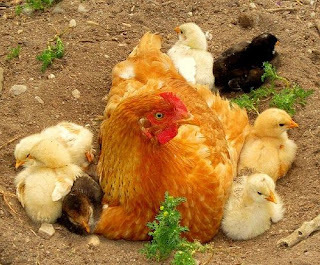 She abandons the rotten eggs and starts caring for the hatched chicks even if it is only one, she will ensure the rest are okay. ✔ 11. She always be at the front of her chicks, leading the way and always clear the danger for them. Those are the lessons we as a people created in the image of Almighty God can learn from Hen in our daily life in other for us to stay positive and succeed in our daily endeavors. "So, Never Give Up especially in doing what is good, just, credible, and noteworthy. God bless you!!!"